This species of Amastigomonas is distinguished by its size, by the lack of any excrescences, and by the short anterior flagellum. Description: Cell 3-7.5 µm long, dorso-ventrally flattened, flexible but not amoeboid. The anterior flagellum emerges from the tip of a laterally directed sleeve, the posterior flagellum trails under the cell and occasionally protrudes behind the cell; strands of cytoplasm may be drawn out behind the cell. The nucleus is situated in the anterior left of the cell. This species has been recorded from marine sites in subtropical and tropical Australia, North Atlantic, Brazil, Arctic Canada, Denmark, England, Gulf of Finland, Greenland, Hawaii and Panama, as well as from freshwater sites in Australia and greater Europe (Ekelund and Patterson, 1997; Lee and Patterson, 2000). Amastigomonas is the senior synonym of Thecamonas. 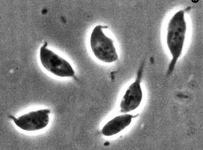 Amastigomonas debruynei is indistinguishable from Thecamonas trahens, A. borokensis and A. caudata (Ekebom et al., 1996; Lee and Patterson, 2000). The most similar species are A. bermudensis Molina and Nerad, 1991 and A. terricola Ekelund and Patterson 1997. A. bermudensis is, at 8 - 11.5 µm, marginally larger, and A. terricola has a longer anterior flagellum. A. mutabilis is said to be distinguishable because it measures up to 15 µm and often has lines of granules located ventrally adjacent to the posterior flagellum. A. debruynei is distinguished from A. filosa because it lacks the thin cytoplasmic extensions which are distinctive for A. filosa. We suspect that some of these differences will not be sustainable. The genus has not been extensively documented. Additional studies suggest that there will be a continuum of form which embraces A. debruynei, A. bermudensis, A. terricola and perhaps even A. mutabilis. Ekelund, F. and Patterson, D. J. 1997. Some flagellates from a cultivated garden soil in Australia. Archiv für Protistenkunde 148: 461-478. Ekebom, J., Patterson, D. J. and Vors, N. 1996. Heterotrophic flagellates from coral reef sediments (Great Barrier Reef, Australia). Archiv für Protistenkunde 146: 251-272. Larsen, J. and Patterson, D. J. 1990. Some flagellates (Protista) from tropical marine sediments. Journal of Natural History 24: 801-937. Lee, W. J. and Patterson, D. J. 2000. Heterotrophic flagellates (Protista) from marine sediments of Botany Bay, Australia. Journal of Natural History 34: 483-562. Page: Tree of Life Amastigomonas debruynei de Saedeleer 1931. Authored by David J. Patterson. The TEXT of this page is licensed under the Creative Commons Attribution License - Version 3.0. Note that images and other media featured on this page are each governed by their own license, and they may or may not be available for reuse. Click on an image or a media link to access the media data window, which provides the relevant licensing information. For the general terms and conditions of ToL material reuse and redistribution, please see the Tree of Life Copyright Policies.